With so much going on, we did not get a chance to cover the October 11, 2010, Introductory Statement by Ms. Michelle Bachelet (right), Executive Director and Under-Secretary-General of UN Women delivered at the 65th Session of the General Assembly (Third Committee). As we've noted before (here and here), in July 2010, the United Nations created UN Women, the United Nations Entity for Gender Equality and the Empowerment of Women, which merges several U.N. organizations devoted to the global advancement of women. 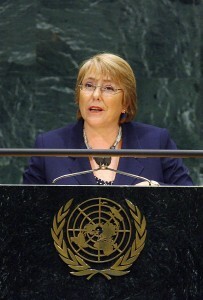 Under the direction of Bachelet, former President of Chile, UN Women is slated to be fully operational in January 2011. It is a great honour for me to address the Third Committee of the General Assembly in my first formal interaction with Member States as the first Executive Director of UN Women. I express my deep appreciation to the Secretary-General for his confidence in entrusting me with the privilege and responsibility of building the newly established United Nations Entity for Gender Equality and the Empowerment of Women. Let me congratulate the General Assembly for having the vision and commitment to put words into action. The quote that we heard so often at the Summit on the Millennium Development Goals just three weeks ago — that gender equality and women’s empowerment are goals in their own right and central to all the other goals — must be more than a mantra. It must become a lived reality for women and men and boys and girls in all countries. The establishment of UN Women sends a clear message that this General Assembly understands that far more is needed. I am well aware that the journey to the establishment of UN Women was a long process that involved many different government partners, non-governmental organizations and women’s rights networks worldwide, as well as the UN’s leadership and the staff of the four existing entities. In that process, we have built both committed constituencies and high expectations. We cannot let them down. deliver important benefits for gender equality and women’s empowerment. ► Firstly, by elevating the leadership of UN Women to Under-Secretary-General, you have sent a clear message that gender equality must be given a priority that is on par with other development priorities. This is important for the United Nations system; but it will also have reverberating effects on the ground, causing national partners, as well, to re-examine how gender equality expertise is positioned within government ministries, cabinets and civil society coalitions. ► Secondly, we have taken an important step towards greater coherence, a central tenet of United Nations reform. We now are well positioned to bridge the operational and normative aspects of the UN’s support to Member States to advance gender equality, and also to have a stronger voice to ensure a more coherent UN system response. In this regard, let me express my deepest appreciation to the leadership and staff of the four entities, namely the Division for the Advancement of Women, the Office of the Special Adviser on Gender Issues and Advancement of Women, the International Research and Training Institute for the Advancement of Women (INSTRAW) and the United Nations Development Fund for Women (UNIFEM), for their professionalism and unswerving commitment to the shared goal of women’s empowerment, rights and equality. ► And, thirdly, in establishing UN Women, you have acknowledged that financial investments in gender equality must also be commensurate with the ambition of our vision for change. We must reverse decades of accepting minimal resources for work on gender equality. In almost every field where we examine budgets through a gender lens — whether in post-conflict reconstruction or in support to agricultural development — we see that rarely is more than 6 percent of the budget visibly dedicated to women’s empowerment and gender equality. A strong UN Women will advocate for larger investments and a commitment to make budgets respond to gender equality considerations. In that regard, let me also congratulate the Secretary-General and the many partners who joined in the Global Strategy for Women’s and Children’s Health announced during the Summit on the MDGs [Millenium Development Goals]. An initiative that promises investments of up to US$42 billion — where the slow rate of progress has been unacceptable and holds back all of the MDGs — is encouraging for all those who are committed to women’s rights and gender equality. The 15-year review of the implementation of the Beijing Declaration and Platform for Action in March 2010 showed promising trends, with a continued impressive record of countries agreeing to constitutions, laws and policies that advance women’s rights. But the implementation challenged persists. ► The Ministerial Declaration adopted by the Economic and Social Council in July 2010 drew further attention to implementation gaps in the achievement of gender equality and the empowerment of women, and agreed to pursue a series of strategies across all areas to close those gaps. ► The Heads of State and Government met at the United Nations just a few weeks ago on the Millennium Development Goals against a backdrop of slow progress in the gender equality dimensions of these targets. ► The forthcoming tenth anniversary of Security Council resolution 1325 on women, peace and security later this month will be an occasion to put in place new strategies for progress. ► Although Member States set the goal of universal ratification of the Convention on the Elimination of All Forms of Discrimination against Women (CEDAW) for 2000, ten years later, it still has not been reached. contribute as equal partners to all aspects of development. global reviews that have taken place over the past year. Over the next three months, I will focus on four major tasks. ► First, we are making all necessary efforts for UN Women to be operational by 1 January 2011 and laying the foundations of the new organization with a new identity and vision. I wish to thank the Deputy Secretary-General for her leadership of the process leading up to the resolution and transition. I wish to also thank the Senior Managers of the four entities that now make up UN Women, and the Transition Team for the excellent work already undertaken to integrate institutional and administrative processes. I look forward to meeting and working with all UN Women staff, at Headquarters and in the field. As we move forward, we will place a very early focus on strengthening UN Women’s capacity in the field so that we can deliver where the need is greatest and to respond to demands for vastly enhanced support of Member States. ► UN Women is committed to strengthening the response of the entire UN system to assist Member States to advance gender equality. That is why my second priority is to consult and strengthen collaboration with entities of the United Nations system to determine how, together, we can start a new era where the gender equality support from the entire system, including UN Country Teams on the ground, achieves greater coherence, depth and impact, and where we truly can deliver as one. This is crucial in every country and every sector, whether in relation to the way that the UN system responds to sexual violence — and in that regard, I look forward to building a strong partnership with the Special Representative of the Secretary-General on Sexual Violence, Margot Wallström [left], and recognize the Special Rapporteur on Violence against Women, Rashida Manjoo [above left]. I also look forward to UN Women’s support to countries to implement the CEDAW Convention and recognize the Vice-Chair of the Committee, Ms. Xiaoqiao Zou, who will be addressing you later this morning. We will build on good practices and I look forward to spearheading a systematic and coordinated approach to collaboration across the system, from global to national level. ► My third priority is to re-engage with the many constituencies that advocated so vigorously for the establishment of UN Women. I remember, when I travelled to Haiti shortly after the horrific earthquake, how important it was to listen directly to the women who were affected and who always know what it is that they need to rebuild the country, but who, too often, are not at the tables where these decisions get made. In setting priorities for UN Women, I look forward to hearing from women’s groups and networks from countries worldwide. We are already receiving statements, manifestos and many expressions of support and guidance. It is imperative for me to understand, with as much specificity as possible, what women from every country and region of the world expect from UN Women. ► In his comprehensive proposal leading to UN Women, the Secretary-General determined that US$500 million will be required for UN Women’s start-up phase, with the bulk for catalytic, country-specific United Nations programmatic support. We intend to meet this challenge in 2011. My fourth area of focus over the next three months is to reach out to Member States and to also build new innovative partnerships to secure these new resources so that UN Women can make the necessary investments for gender equality and women’s empowerment, and so that we can turn aspirations into change for women and girls. Member States’ support will be crucial in enabling UN Women to deliver on all these priorities. Later this fall, the relevant bodies of the General Assembly will be reviewing the Secretary-General’s proposal for the revised use of the regular budget component of UN Women for 2011, including options for the administrative arrangements for the regular budget. I look forward to the Assembly’s support for this proposal, and in particular the approval of the so-called grant modality, to enable UN Women to function as a truly composite entity with a clear identity and a strong esprit de corps. I look forward to the Economic and Social Council’s election of UN Women’s Executive Board so that it can be established and initiate its work without delay. Over the next weeks and months, we will embark on a consultative process involving all stakeholders to develop UN Women’s future strategy. The hallmarks of the strategy will align with the founding resolution. It will focus on expanding support to Member States at the national level, in line with national priorities; strengthening coherence between the normative support provided to global intergovernmental processes and the technical and thematic advice provided to national partners at the country level; and strengthening leadership, coordination and accountability on gender equality and women’s empowerment and support to gender mainstreaming across the United Nations system. As we move forward, UN Women has the unique opportunity to strengthen coherence between the policy/normative guidance generated by intergovernmental bodies and operational support provided to national partners at the country level. This Assembly plays a primary role in policy-making for gender equality and women’s empowerment, and in follow-up and monitoring the implementation of these policies and norms. This brings me to the reports that have been prepared for consideration by this Committee by the offices that now make up UN Women, and which I have the pleasure of introducing. I also draw delegations’ attention to the briefing note on these reports of 1 October, by Ms. Rachel Mayanja [above right], Assistant Secretary-General and Special Advisor on Gender Issues and Advancement of Women, and Ms. Joanne Sandler [below right], Deputy Executive Director of UNIFEM, now part of UN Women, which is available in the room. One area that has clearly moved to the centre of global and local attention is ending violence against women. Two reports before the Committee — on intensification of efforts to eliminate all forms of violence against women (A/65/208) and on trafficking in women and girls (A/65/209) — are indicative of the scope and range of actions taken by Member States and other stakeholders to strengthen legal frameworks, adopt dedicated policies, enhance prevention measures, improve support services for victims/survivors, and expand data collection. Yet, notwithstanding this attention, violence against women continues in all parts of the world, and trafficking in women persists. The reports highlight key actions and strategies that should be in place and effectively enforced. I call on this Committee to continue its critical work in this area, and I pledge UN Women’s enhanced support at national level to strengthen implementation of your recommendations. Last March, the Commission on the Status of Women commemorated the 15th anniversary of the adoption of the Beijing Declaration and Platform for Action. This Assembly has annually contributed to the follow-up effort. The report before you (in document A/65/204) focuses on progress made by intergovernmental bodies in gender mainstreaming. It concludes that certain bodies, such as this Committee as well as the Second Committee, were more likely to address gender equality issues in their work, while the large majority of outcomes of the other Main Committees did not explicitly address gender equality aspects. There is thus a need for improved monitoring and reporting on progress in relation to policies, strategies, resource allocations and programmes. This Committee should continue to take a leading role in monitoring measures taken and progress achieved. Also before this Committee is a report on the improvement of the status of women in the UN system (A/65/334). Its statistical data give a quantitative picture of the extent and rate of progress towards the goal of gender parity, and the results are mixed. At the senior-most levels, the advances are unprecedented. However, at the professional levels progress remains far less encouraging. In overall terms, the representation of women in the entities of the UN system increased only 1.5 percentage points, from 38.4 to 39.9 percent, over the current two-year reporting period. The report identifies a number of good practices with a positive bearing on progress, and submits a set of recommendations to accelerate the representation of women in the UN system. Finally, the Secretary-General’s annual Note on the 2009 activities of UNIFEM is also before the Committee (A/65/218). 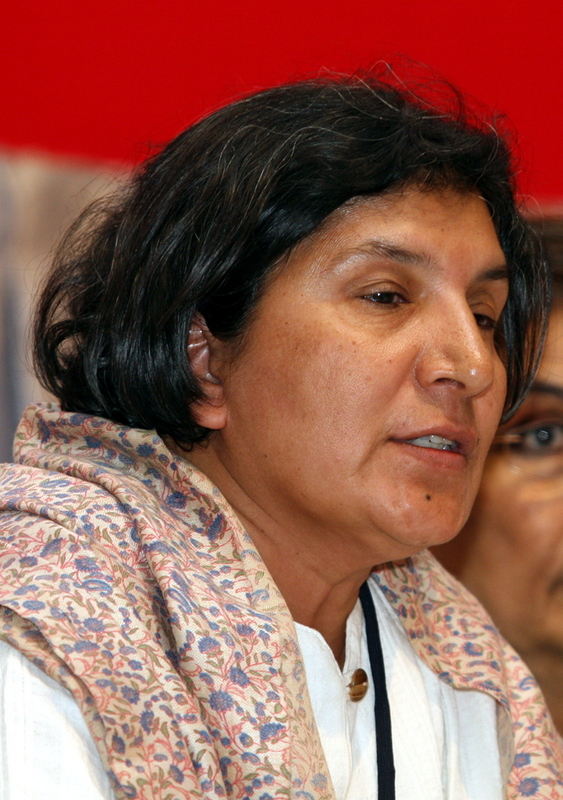 As the report notes, UNIFEM has been able to stretch its limited resources to respond to demands for support in 98 countries, in support of laws and policies to improve women’s rights, to institutionalize gender-responsive budgeting for greater accountability and resources for gender equality, and to support women as candidates and voters in a growing number of national and local electoral processes. The report also shows a critical focus on building the agency and voice of those women who are most excluded: HIV-positive women, women home-based workers, indigenous women, rural poor women, women in crisis situations, and women survivors of sexual and domestic violence. Finally, the report shows that the demand for the UN’s support on gender equality far outpaces its ability to respond. And in that, esteemed colleagues, it provides yet another building block in the case for a strong and effective UN Women, including through expanding the reach and effectiveness of the UN Trust Fund to End Violence against Women. I look forward to my dialogue with you today and to many more in the years to come. I thank you for your kind attention.